John Freshwater’s “closing statement brief” was released Thursday. The 180 page document, including diagrams, provides extensive arguments for why the allegations made against Freshwater are unsubstantiated. The brief draws upon the many witnesses who testified during the hearing that began in October of 2008. “1. Any and all matters related to John Freshwater’s use of a Tesla Coil were adjudicated by Principal William White’s letter to John Freshwater dated January 22, 2008. “2. The Academic Content Standards were not applicable in the Mount Vernon City School District until the beginning of the 2004-2005 school year. “A. John Freshwater taught his 8th grade students exactly as he was required as evidenced by the only known assessment tool authorized in the State of Ohio; the Ohio Achievement Tests. John Freshwater’s students received proper instruction resulting in him being the only 8th grade teacher whose students achieved a proficient rating of seventy-seven (77%) percent on the Ohio Achievement Tests despite his classes containing the most special education students. “B. Ten (10) eyewitness students, two (2) teachers and one (1) principal testified John Freshwater never instructed on the topics of creationism nor intelligent design. “3. John Freshwater complied with all of the known parameters as he facilitated, monitored and supervised the Fellowship of Christian Athletes (FCA). “A. 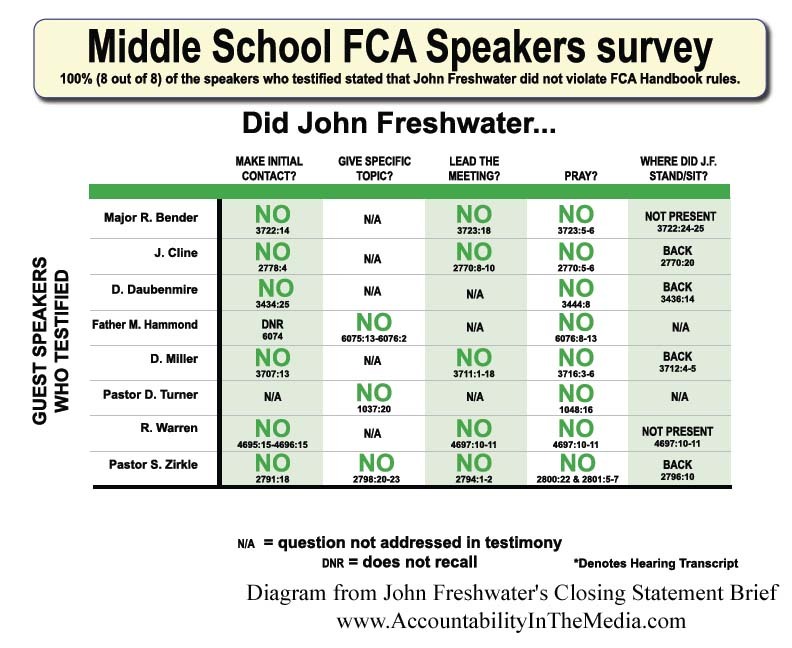 Witness testimony from credible sources clearly demonstrates John Freshwater did not conduct nor lead any prayers during FCA meetings. “B. Witness testimony from credible sources clearly demonstrates John Freshwater never asked non-familial students to lead prayer in FCA meetings. “C. 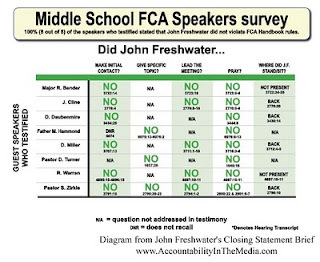 Witness testimony from credible sources clearly demonstrates John Freshwater did not exceed his role as facilitator, monitor and supervisor of the FCA. “4. John Freshwater exercised a constitutional right to have a personal Bible in his classroom on his desk. “A. John Freshwater removed all items he was lawfully asked to remove. “B. John Freshwater did not receive any instruction from Principal William White or anybody else to remove the patriotic poster, which was distributed through the Mount Vernon Middle School office, depicting former President George Bush and Colin Powell. “C. John Freshwater never intended or tried to ‘make a point’ by bringing additional religious articles into his classroom. “At the conclusion of this brief, John Freshwater will respectfully request the Referee to evaluate and find each of the employer’s allegations against John Freshwater as detailed in the Amended Resolution of Intent to Consider the Termination of the Teaching Contract(s) of John Freshwater to be unsubstantiated. For additional coverage of the Freshwater hearing, see the articles in the archive. August 13, 2010 David Millstone’s brief on behalf of the Mount Vernon Board of Education. 239 KB PDF. August 20, 2010 R. Kelly Hamilton’s rebuttal on behalf of Freshwater. 5.64 MB PDF. August 20, 2010 Millstone’s rebuttal on behalf of school board. 180 KB PDF. The above three documents were obtained from the National Center for Science Education. Freshwater’s “closing statement brief” was released Thursday by attorney Hamilton. Sam, please email me at rbh[dot]third[at]gmail[dot]com. When posting a link, please also provide a comment.